Capital Care Norwood has advised that the closure of 105 street from 112 ave south to the entrance into McDonald’s will remain open for another 2 weeks due to a delay in getting the paperwork from the city. Spruce Ave community, have your say on what replacement homes look like in our neighbourhood! The City of Edmonton is hosting a 3-hour workshop at Spruce Avenue Community League hall for the upcoming Infill Design Competition. This year’s design competition focuses on our community! Competition designers will propose a design on a site owned by the City of Edmonton. Postcard for Infill Design Competition Workshop to determine criteria. 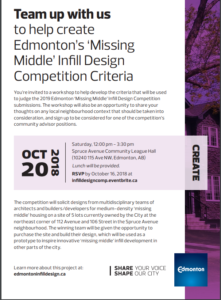 Residents of Spruce Avenue are invited to a workshop to help develop the criteria that will be used to judge the 2019 Edmonton ‘Missing Middle’ Infill Design Competition submissions. The workshop will also be an opportunity to share your thoughts on any local neighbourhood context that should be taken into consideration, and sign up to be considered for the competition’s community advisor positions. Time: 12:00 p.m. to 3:30 p.m. Lunch will be provided at 12:00 p.m., and workshop will start at 12:20 p.m. The competition will solicit designs from multidisciplinary teams of architects and builders/developers for medium-density ‘missing middle’ housing on a site of 5 lots currently owned by the City at the northeast corner of 112 Avenue and 106 Street in the Spruce Avenue neighbourhood. The winning team will be given the opportunity to purchase the site and build their design, which will be used as a prototype to inspire innovative ‘missing middle’ infill development in other parts of the city. The City of Edmonton will gather input on the community criteria for the competition at this workshop, which is open to the wider community. For more details, see the postcard: Missing Middle Design Competition – Spruce Avenue! Check out the Fall 2018 community newsletter: SACL fall 2018 newsletter. The newsletter is distributed to the Spruce Avenue community by volunteers from your community league board. Courtesy of the Edmonton Federation of Community Leagues (EFCL), Spruce Avenue community members can RSVP to secure a seat on the buses (return trip) to the Enoch Cree Nation 26th Annual Pow Wow on July 14. 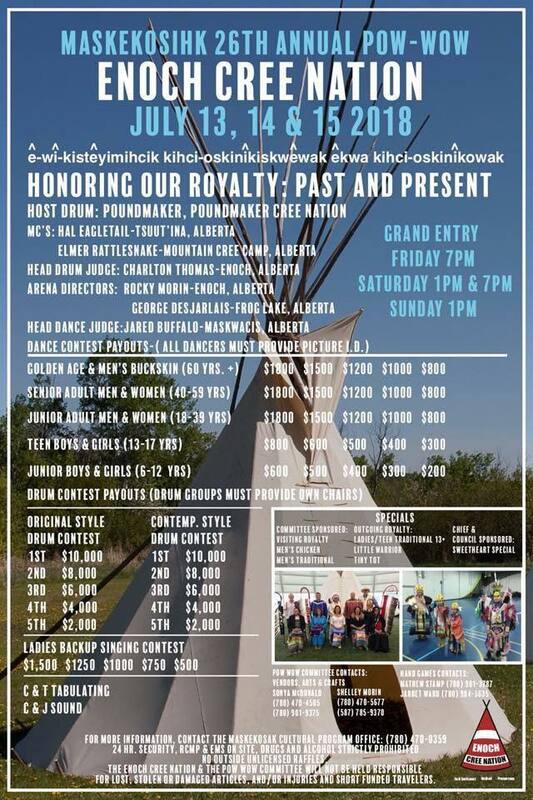 RSVP by email to robin.cisek@efcl.org or RSVP online. Neighbourhood Renewal is well under way in our area. A note: when the sidewalk forms are being placed and/or concrete is being poured, it is not always possible for the mail carrier to deliver to mailboxes. If your street is experiencing this construction and you have not been getting your mail, you can go to the post office at 10536 96st, which is open from 9:30am-2pm. You may need to show a piece of ID. If you are unable to get to that post office during those hours, please call 780-944-3111 ext 2101 and ask for your mail to be delivered to the Shoppers’ Drug Mart post office (Kingsway Mall).